The new tax rules retain seven federal income tax brackets, but tax rates and thresholds have changed. There are seven federal tax brackets: 10%, 12%, 22%, 24%, 32%, 35% and 37%. The bracket depends on taxable income and filing status. Our first set of tables shows the tax brackets and federal income tax rates that apply to the 2018 tax year and relate to the tax return you’ll file in 2019. The second set shows the brackets and rates that apply to the current 2019 tax year and relate to the tax return you’ll file in 2020. Looking for more on the new tax rules? Dig in with our full breakdown of the law. The United States has a progressive tax system, meaning people with higher taxable incomes pay higher federal income tax rates. Being “in” a tax bracket doesn’t mean you pay that federal income tax rate on everything you make. The progressive tax system means that people with higher taxable incomes are subject to higher federal income tax rates, and people with lower taxable incomes are subject to lower federal income tax rates. 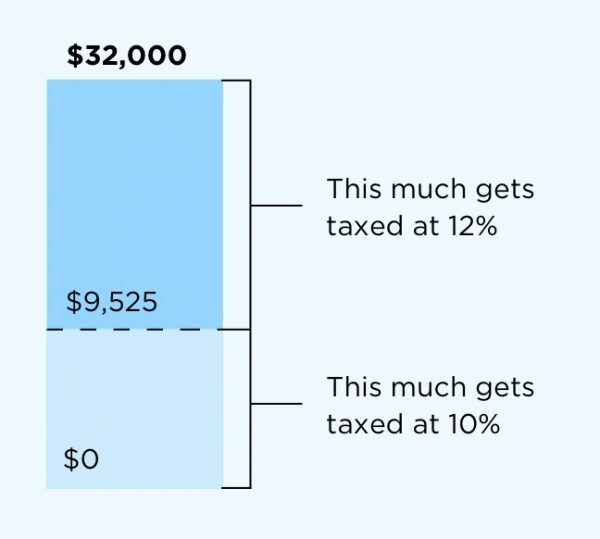 The government decides how much tax you owe by dividing your taxable income into chunks — also known as tax brackets — and each chunk gets taxed at the corresponding tax rate. The beauty of this is that no matter which bracket you’re in, you won’t pay that tax rate on your entire income. 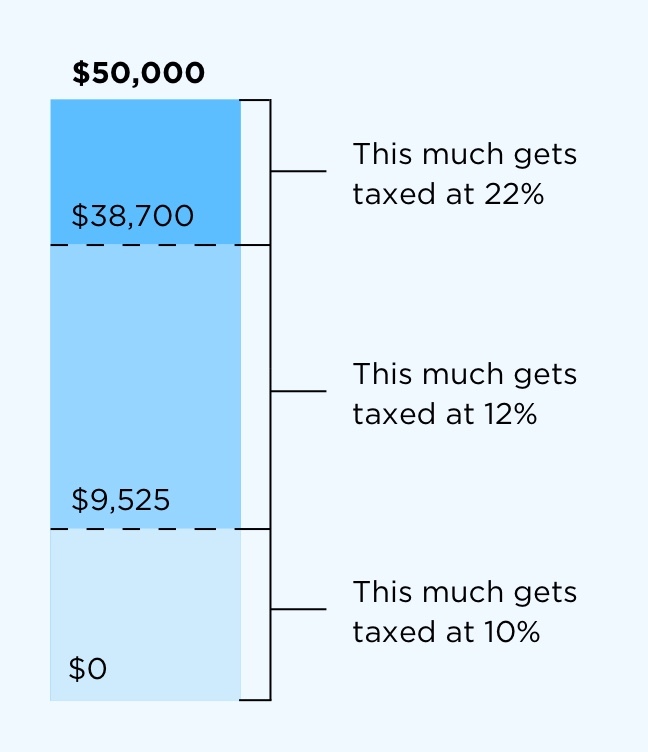 Example #2: If you had $50,000 of taxable income, you’d pay 10% on that first $9,525 and 12% on the chunk of income between $9,526 and $38,700. And then you’d pay 22% on the rest, because some of your $50,000 of taxable income falls into the 22% tax bracket. The total bill would be about $6,900 — about 14% of your taxable income, even though you’re in the 22% bracket. That’s the deal only for federal income taxes. Your state might have different brackets, a flat income tax or no income tax at all. Two common ways of reducing your tax bill are credits and deductions. Tax credits directly reduce the amount of tax you owe; they don’t affect what bracket you’re in. Tax deductions, on the other hand, reduce how much of your income is subject to taxes. Deductions lower your taxable income by the percentage of your highest federal income tax bracket. So if you fall into the 22% tax bracket, a $1,000 deduction saves you $220. In other words: Take all the tax deductions you can claim — they can reduce your taxable income and could kick you to a lower bracket, which means you pay a lower tax rate. Being ‘in’ a tax bracket doesn’t mean you pay that rate on everything you make. Curious how federal income tax brackets and rates have changed over the years? Take a look back. Still need to file your taxes this year? Here’s a quick look at some of our top-rated tax-software providers.